Acne can be a real problem for your self-esteem, but it turns out that acne could very well be the result of an emotional issue derived from ONE specific event. As a transformation specialist I have found that many physical problems (and otherwise) are the result of the karma created when the ego handled a situation by building defense mechanisms that may have ultimately hurt others. Not because you are a bad person, but because you only wanted to feel safe. When you're aware of the core emotions behind the problem, you can use EFT to neutralize them. When you use EFT (Emotional Freedom Techniques) to clear up the emotional issues that cause your acne problem, the result is clear skin! Although in my healing work I have found core causes can be very specific to the individual, the EFT statements below utilize Louise Hay's emotional interpretation of the physical problem and may help you. If you are not resonating with Louise Hay's emotional causes, check out my free eBook for more information on how to determine YOUR core emotional cause and to get some examples of core causes of acne that have been discovered in some of my clients. I have had lots of experience with healing acne and some unexpected causes for the acne have shown up in my sessions. EFT works best when you know the core emotional cause of a problem. My free eBook not only teaches you the EFT technique, but also contains a secret method that will help you discover what the core emotioanl cause is. In my free eBook, I have also listed other causes for acne that have shown up in healing sessions. Setup: Even though I may have this acne problem and it may be the result of not accepting the self and a dislike for myself (Hay's words in orange), I deeply and completely accept myself, realizing that I am a Divine expression of life and I love and accept myself where I am right now. By the way, not accepting the self and a dislike for myself may remind you of something that is going on with you and you can also use that event in the setup phrase. If you're having this issue, feel free to be more specific in your setup phrase if you are so aware. “Delete” round of tapping: Eye Brow: “deleting this unacceptance and dislike for myself ", Side of Eye: "deleting the dislike ", Under Eye: "deleting any unacceptance and dislike for myself", Under Nose: "deleting the unacceptance of myself ", Chin: "deleting any emotional reasons for my acne", etc. on all the points, including the gamut, alternating with statements relating to the issue. “Insert” round of tapping: EB: “I am a divine expression of life ", SE: "healing this acne", UE: "I love and accept myself where I am right now", UN: "healing this acne", CH: "inserting love and acceptance of where I am right now", etc. on all the points, including the gamut, alternating with statements that "insert" a feeling of well being. I have seen a lot of different underlying causes for acne in my work. For example, in a session with a client, I saw her with a bit in her mouth and face turning red, indicating she was suppressing angry words. We could guess that releasing those angry words would help the acne, however I also look for the pattern that would be in alignment with smooth, clear skin and that image appeared as words rolling right over the top of her head. The good news is, the energy work is helping to make that shift into a more easy going attitude which is better for everybody. If you need help, I am here for you. In a clairvoyant reading / healing session (now being offered at an introductory rate of $60), I will look for the emotional cause of persistent acne, and any other factor that contributes to the problem. This will create positive transformation in some unexpected areas of your life as well! You can also learn to do this yourself by following the steps outlined and explained in detail in my online consciousness course. There is a short meditation included with this course that will guide you through some of what I do in a healing session and will allow you to experience this type of transformation every single day, if you so desire. As an intuitive life coach and healing practitioner, I am able to detect the patterns that have caused the acne and send healing to each and every pattern that shows up. In another example, when clairvoyantly viewing the causes of acne in different client, I saw an image of her spreading peanut butter on a slice of bread. Although healing was sent to the pattern and her acne disappeared, it came back when she ate peanut butter again, so in this case the message was to stop eating peanut butter. However, deeper healing can be achieved by using the same process on the sensitivity to peanut butter, finding out where that comes from, etc. What is so cool and so awesome and why I love this work is that these patterns can be manipulated energetically and the ultimate result is transformation in so many areas of your life! There is a reason why you experience physical issues such as this and when those reasons are healed, it's amazing how other aspects of your life are healed as well! 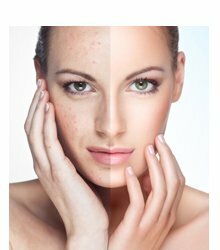 If you'd like to start transforming an acne problem right away, you can purchase an initial session with me for only $60. I offer this low rate for an initial session because I realize you may not be familiar with this type of work and the low rate gives you the opportunity to experience energy healing with a minimal investment. After you purchase your session, I will contact you to schedule your session. I would love to assist you on your journey. Click the link in the signature below to learn HOW and WHY my healing work is effective. Feel free to call me at (949)295-6135 or email me if you have any questions. I have a few ways of working with people (and animals). - Or a coaching session combined with energy healing to transform any physical, emotional, mental or spiritual pattern. - Pet healings are done on the phone with the pet owner. As you tell me about your pet, I scan and correct imbalances that may be manifesting as either physical or behavioral problems. - What you can expect: During the session you may have an experience of feeling the energy move through you. Healing could occur on a physical, emotional, mental or spiritual level. - A 30-day program that teaches you how to create a habit of thinking and acting in a way that brings all good things to you. Free inspirational and educational material. I call them Bright Blips. More than just a photo and a brief message, I try to convey information that helps you make positive changes in your life on a daily basis.